Pronation is a natural motion of your foot during walking and running. Your gait can show a pattern of neutral pronation, overpronation, or supination (underpronation). The stresses of overpronating or supinating have been linked to a greater risk of injuries. Motion control shoes and orthotics may be recommended if you are an overpronator, while flexible and cushioned shoes are better for people who supinate. Learn about these gait patterns and what you can do to correct them. From the time your heel strikes the ground, your arch begins to flatten and cushion the shock. Your weight shifts to the outside of your foot and then back to the big toe. If you have a neutral gait your foot should begin to roll outward with the toe-off. The arch rises and stiffens to provide stability as the foot rolls upward and outward. All of the toes aid in push-off in normal pronation, but the big toe and second toe do more of the work while the others stabilize. During push-off, the sole of the foot is facing the rear of your body in pronation and is not tilted so the sole is facing either inward or outward. The muscles active during pronation are the anterior tibialis, extensor digitorium longus, and the extensor hallicus longus, all of which are supinators of the foot. In overpronation, the ankle rolls too far downward and inward with each step. It continues to roll when the toes should be starting to push off. As a result, the big toe and second toe do all of the push off and the foot twists more with each step. Overpronation is seen more often in people with flat feet, although not everyone with flat feet overpronates. Overpronation leads to strain on the big toe and second toe and instability in the foot. The excessive rotation of the foot leads to more rotation of the tibia in the lower leg, with the result being a greater incidence of shin splints (also called medial tibial stress syndrome) and knee pain. An increased risk of injury and heel pain may also be the result of the stress on the ligaments and tendons of the foot due to overpronation. Motion control shoes, insoles, and orthotics are designed to correct your foot motion in overpronation. Supination is a rolling motion to the outside edge of the foot during a step. The foot naturally supinates during the toe-off stage of your stride as the heel first lifts off the ground, providing leverage to help roll off the toes. However, if supination continues through the toe-off, the weight isn't transferred to the big toe. This results in all of the work being done by the outer edge of the foot and smaller toes, placing extra stress of the foot. Supination is seen more often in people with high, rigid arches that don't flatten enough during a stride. 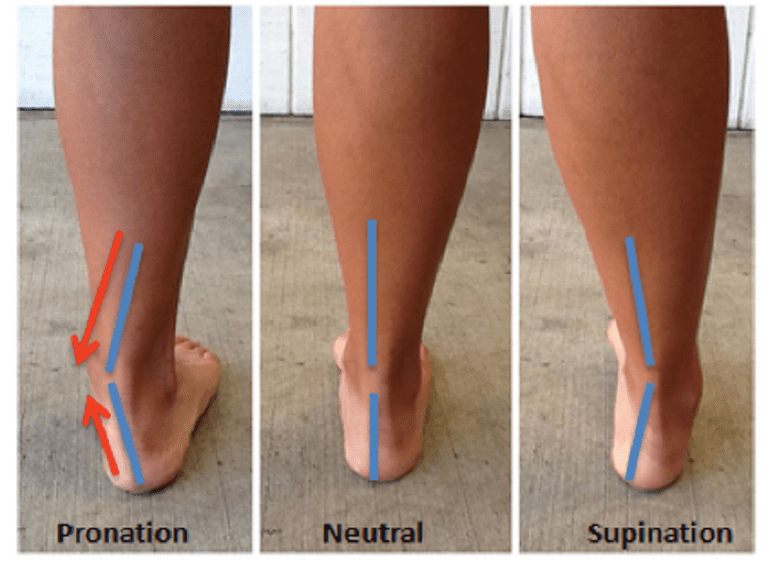 Supination may increase your risk of ankle injury, iliotibial band syndrome, Achilles tendonitis, and plantar fasciitis. Shoes that are well-cushioned and flexible are best for people who supinate. Determining whether you are an overpronator, supinator, or have a neutral gait is the key to selecting the right walking and running shoes. You can do a little self-diagnosis looking at your shoe wear pattern, then get assessed at a good-quality running shoe store or foot and ankle store. Shoe Wear Pattern: Look at the soles of your current walking or running shoes. Overpronators will see more wear on the inner side of the heel and forefoot. Supinators will see more wear on the outside edge of the shoe. Shoe Tilt: Take a pair of shoes or boots you have been wearing regularly for several months. Put them on a table with the heels facing you. If the heels tilt inward due to more wear on the inner side of the heel, you may be an overpronator. If the heels tilt outward, you may be a supinator. Have an Athletic Shoe Expert Watch You Walk or Run: The salespeople at specialty running shoe stores are trained to spot overpronation. Bring a worn pair of shoes with you so the staff person can see the shoe wear pattern. The salesperson may watch your walk or run outside or on a treadmill and may do a video gait analysis. Foot Analysis: You can get a foot analysis at a specialty foot and ankle store or at some running shoe stores. They may use a foot pressure scan as well as other methods to get a full picture of your gait pattern and where you place stress on your foot. Podiatrist: If you have ongoing foot or ankle pain, numbness, tingling, loss of function, or an injury, you should see a podiatrist. This medical professional can fully diagnose your foot health problems and prescribe custom orthotics, medication, and other therapies to correct them. If you have mild to moderate overpronation or supination you can select the right kind of shoes for your gait for better walking and running comfort. If your gait has a more severe dysfunction, you may need prescription orthotics from a podiatrist. Overpronators may benefit from motion control shoes to help correct their gait. Motion control shoes have increased medial support and stiffer construction to guide the foot into a proper amount of pronation. They are heavier and stiffer than most neutral athletic shoes. While it has been common practice for many years to steer overpronators to motion control shoes, the research into whether these shoes prevent injury is mixed and there are few well-controlled trials. For example, military recruits have been given motion control shoes if they overpronate, yet the rate of injury in basic combat training remained the same as when all recruits trained in military boots. You may see a debate about the value of motion control shoes for recreational runners and fitness walkers. Custom orthotics can provide motion control for those who have severe overpronation. These are prescribed by a podiatrist and individually designed to meet the specific need of each foot. While they can be expensive, they may offer you relief if you have developed foot or leg pain. In the long run, this expense is money well-spent if it means you can walk and run pain-free. Overpronation can lead to extra stress and tightness of your calf muscles. You may want to do calf stretching exercises to help overcome this. Supinators do well with neutral shoes and should look for well-cushioned shoes that can absorb more of the impact of each stride. If you supinate, you do not need motion control shoes or stability shoes. Instead, flexible shoes will allow you a better range of motion and you may benefit from shoes or insoles that have more cushioning. If you have a severe supination problem, you can see a podiatrist for custom orthotics. Walking and running are great activities to build fitness and reduce health risks. Getting fit properly for athletic shoes will help you achieve the best speed, endurance, and comfort. If you have any pain that keeps you from enjoying walking or running fully, see your doctor or podiatrist to find the best solution. Heel Pain. American Podiatric Medical Association. https://www.apma.org/Patients/FootHealth.cfm?ItemNumber=985. How to Read Your Footprint. American Orthopaedic Foot & Ankle Society. http://www.aofas.org/footcaremd/how-to/foot-health/Pages/How-to-Read-Your-Footprint.aspx. Malisoux L, Chambon N, Delattre N, Gueguen N, Urhausen A, Theisen D. Injury Risk in Runners Using Standard or Motion Control Shoes: A Randomised Controlled Trial With Participant and Assessor Blinding. British Journal of Sports Medicine. 2016;50(8):481-487. doi:10.1136/bjsports-2015-095031. Reinking MF, Austin TM, Richter RR, Krieger MM. Medial Tibial Stress Syndrome in Active Individuals: A Systematic Review and Meta-analysis of Risk Factors. Sports Health. 2017;9(3):252-261. doi:10.1177/1941738116673299. Yeung SS, Yeung EW, Gillespie LD. Interventions for Preventing Lower Limb Soft-Tissue Running Injuries. Cochrane Database of Systematic Reviews. June 2011. doi:10.1002/14651858.cd001256.pub2.